When you wake up in the morning, any dorm floor space outside of your dorm rug is going to be cold! One of the worst things in the morning is stepping on a cold dorm room floor. It is a very unpleasant jolt that will wake you up but it is going to wake you up uncomfortably. You need to ease into your morning correctly, so what do you do? Sleeping in socks may make you overly warm at night and when you step on the cold dorm floor, you're still going to feel it through your socks. Dorm slippers may not offer you the warmth and comfort that you want. Look no further than our Dorm Snoozies for warmth and comfort to start your morning right! Our Dorm Snoozies are super comfortable and soft. You will love to start your morning with our incredibly comfy Dorm Snoozies and you will even find yourself putting them on when you come back to your dorm room after class because they are just that comfortable! Made of brushed fleece on the outside and super soft Sherpa fleece on the inside with a non-skid sole, you will be reaching for these cute dorm essentials every time you go to the dorm common room to hang out with friends or to the basement laundry room to do laundry. 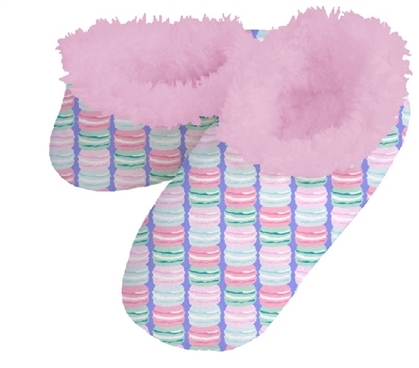 Plus, with such a cute multi-colored macaroon pattern on them, you will be comfy while adding fun, festive design to the coziest dorm foot coverings you will ever own!